"Cardiothoracic Surgery Review" covers all of the core knowledge necessary to pass the cardiothoracic boards or the cardiothoracic recertification exam. Each topic presents core information in two-to-four pages and concludes with a brief list of the most important references. 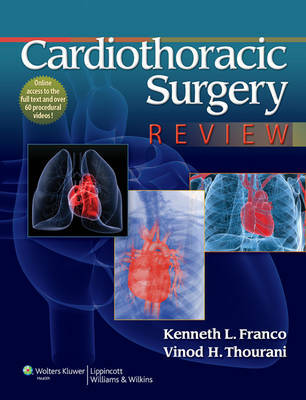 The topics cover all areas in cardiothoracic surgery, including cardiac surgery, pediatric cardiac surgery, and thoracic surgery. Included with the book is a companion website featuring the fully searchable text and over 60 procedural videos. This topic-based review is ideal for anyone needing to rapidly reference an up-to-date knowledge base in cardiothoracic surgery, including cardiothoracic fellows, practitioners studying for recertification, and surgical nurses.